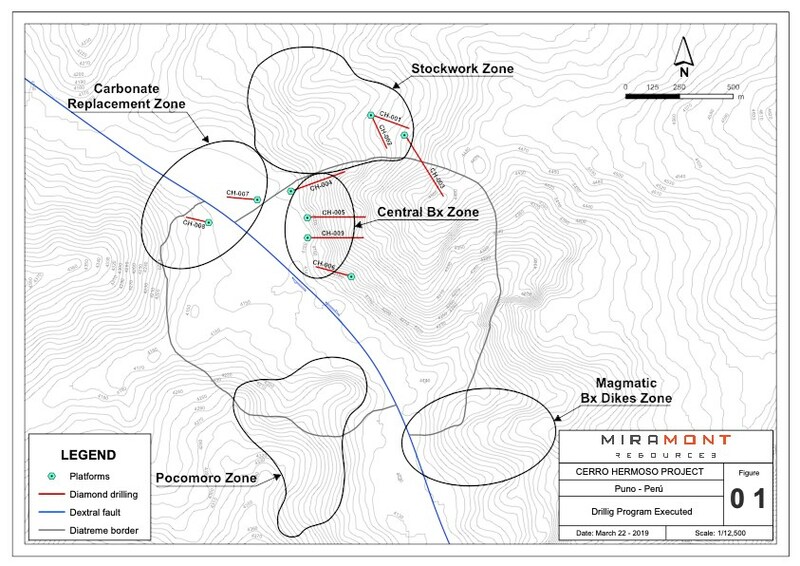 Vancouver, British Columbia--(Newsfile Corp. - March 28, 2019) - Miramont Resources Corp. (CSE: MONT) (OTCQB: MRRMF) (FRA: 6MR) ("Miramont" or the "Company") is pleased to announce that it has now completed 3,679 meters in nine diamond drill holes. The Company has received assay results for six of the nine holes. 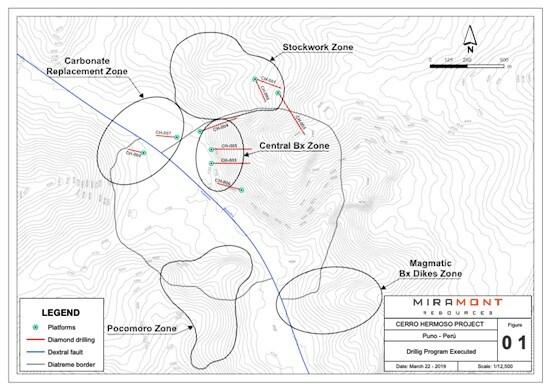 Although drilling has confirmed the basic geologic model that Miramont had developed for this district, significant mineralized drill intercepts thus far appear intermittent and discontinuous. Drilling was planned to test three principal targets of the five targets currently identified. The existence of a deep-rooted hydrothermal system was determined, as was the presence of a buried intrusion as surmised from geophysical studies. The location of the nine drill holes is shown on the accompanying map. Bill Pincus, Miramont's President and CEO said: "We are satisfied that we have confirmed our basic deposit model. Our understanding of the three-dimensional nature of this mineralized system has expanded with this program, but thus far, mineralized intercepts have proven to be discontinuous. Once we have received the results for all nine drill holes, we plan to evaluate data to develop a better understanding of hydrothermal fluid flow vectors. We will model all new data so as to best determine the controls on economic mineralization, where to best find it and how Miramont will best go forward." The table below highlights selected high grade intervals. Values as high as 14.75 ppm Au and 110 ppm Ag were found. Significant base metal values were also encountered. Assays were completed first by SGS and then by ALS Laboratories in Peru. Future samples will be analyzed by ALS as primary laboratory. Miramont follows rigorous sampling and analytical protocols that meet industry standards. Core samples are stored in a secured area until transport in batches to either SGS or ALS prep labs in Arequipa, Peru. Sample batches include certified reference materials, blanks, and duplicate samples are then processed under the control of ALS or SGS. ALS samples are analyzed using the ME-ICP61 (a technique that provides a comprehensive multi-element overview of the rock geochemistry), while gold is analyzed by AA24 and GRA22 when values exceed 10 g/t. Over limit silver, copper, lead and zinc are analyzed using the OG-62 procedure. SGS samples are analyzed using the ICP 40B method while gold is analyzed by FAA515. Over limit silver, copper, lead and zinc are analyzed using the AAS41B procedure.